Apart from having a PhD in laser physics, Goran Zgrablić is also a gourmet vagabond and passionate wine lover with a degree from Italian Sommelier Association. He’s obsessed with homemade local produces and rustic cooking style inherited from his Istrian family. Taking care of his olive grove and participating in sensorial judging of Istrian extra virgin olive oil are his two favorite kinds of relaxation. He’s previously lived in Switzerland for five years and currently splits his life between Trieste, Italy and his hometown Pula in Istria, Croatia. Goran is author of the Istrian food and wine blog Manjada and a founder of Taste of Croatia – the independent gourmet guide to Croatia – where he mostly writes about Croatian wines and wine regions. He writes restaurant reviews for a major Croatian newspaper and has been compiling the Vinologue Istria enotourism guidebook. Check him out on TripAdvisor and feel free to contact him here. 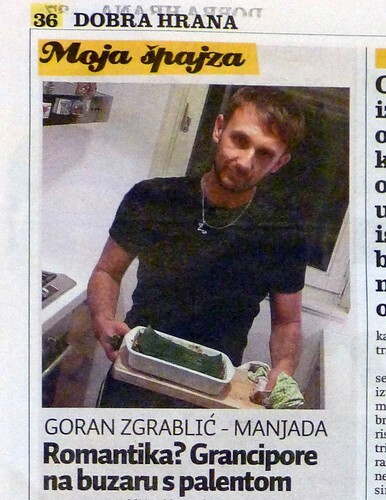 Interview in Dobra Hrana, Sunday culinary supplement of Jutarnji List (the most popular Croatian newspaper). Click on the picture to see it full size. Here is my English translation.